Monterey-Salinas Transit has a bus stop at the Marina Library! See Route 27 details on their website! Click here to search the MCFL catalog! NEW! BOOKSTORE Friends' Community Bookstore, 330 Reservation Rd. Suite F. Marina Ca. NEW! We have opened a used bookstore in Marina! 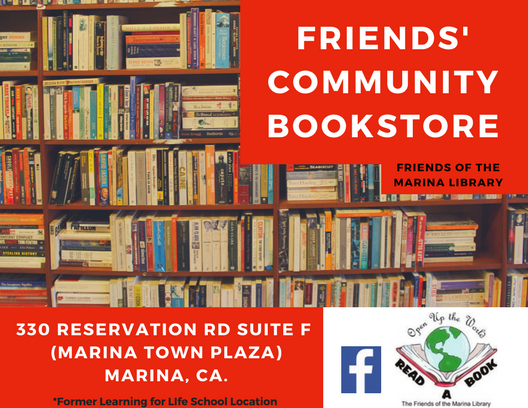 Check out the Friends' Community Bookstore, located at 330 Reservation Road Suite F in the Marina Town Plaza shopping center. Books and other used materials are for sale at our low cost prices Tuesday-Sunday 10 a.m. - 4 p.m. Our store is all-volunteer run with proceeds benefiting the Marina Library (and County library system). To reserve The Marina Library Community Room for your event, please use the library's new online room rental site: Here. If you have questions, call the Marina Library at 831-883-7507. 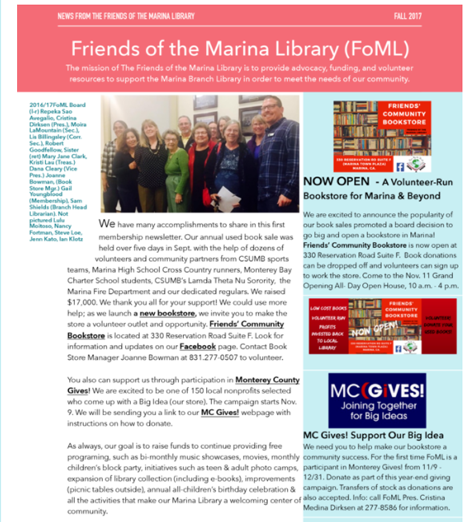 Do not contact the Friends of the Marina Library. We do not handle the room rental.